Who's got the thyme? : The Last Hoorah? Are you one of those people that gets all depressed that it's Labor Day and summer is over? If you're a teacher I'm sure you are. Personally, I'm pretty sure it's going to remain hot out for another few weeks so It doesn't bother me much. Of course, gone will be the days of "summer hours". Basically that's the excuse we use for eating dinner at 7:30ish every night (we're guilty of pushing 9pm as well). With School (homework) and sports (soccer) starting up, I need to get back on the ball and back to planning dinners that can be made simply and quickly (and at a normal time). 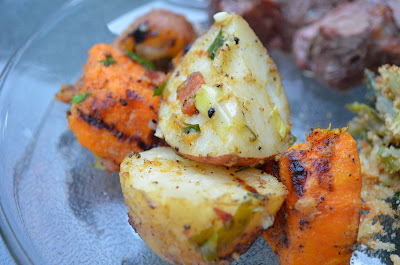 But for those of you wrapping up the summer season with festivities in the form of cookouts, I've got one fantastic summer side for you to share with your guests. Grilled Potato Salad with Bacon Scallion Vinaigrette from Melissa D'Arabian of the Food Network. Forgive me for starting out with a blurry picture. On this particular day I was making three new recipes simultaneously! So you chop up a sweet potato (or yam) into large chunks. Then you quarter 7 medium red skinned potatoes. You cook them in boiling water and then drain and set them aside to cool. While that's going on you whip up a dressing of light mayo, Dijon mustard, onion powder, garlic powder, cayenne pepper and of course some salt and pepper. 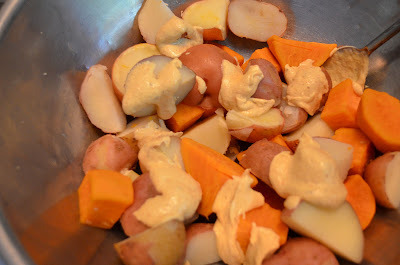 Once the spuds are cooled you add the dressing to them, mixing gently to keep them well in tact. Next you move them to the grill where you grill each side for a few minutes. Don't fret if you loose some in the grates, happens to the best of us. The final step is to make a vinaigrette that involves a slice of bacon and it's juice (just kidding, grease), a little olive oil, red wine vinegar, Dijon mustard, scallions and parsley. Whisk the vinaigrette and then toss with grilled potatoes to coat and this magic occurs! This is good stuff. I hope you decide to try it, your guests will dig it for sure. Preheat a grill to medium. Put red potatoes in a large saucepan and cover with cold water by 2 inches. Bring the water to a boil over high heat. 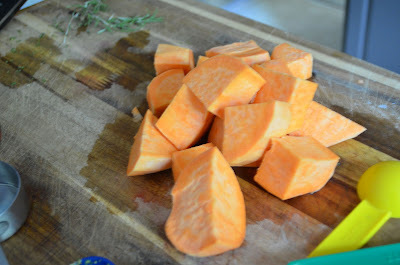 Once the water begins to boil, after 10 min, add the sweet potatoes. Return to a boil and cook 10 min more. Drain the potatoes and set aside to cool. 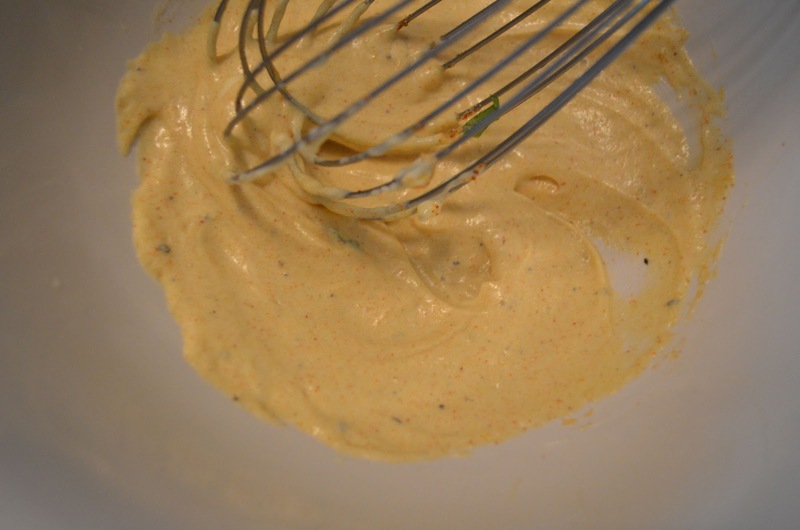 In a medium bowl, whisk the mayo, mustard, onion powder, garlic powder, cayenne pepper, salt and pepper to taste. When potatoes are cool to the touch, gently toss them in the mayo mixture to coat. Make the vinaigrette: Cook the bacon in a small skillet over medium heat until crisp, then set aside to cool in the skillet. 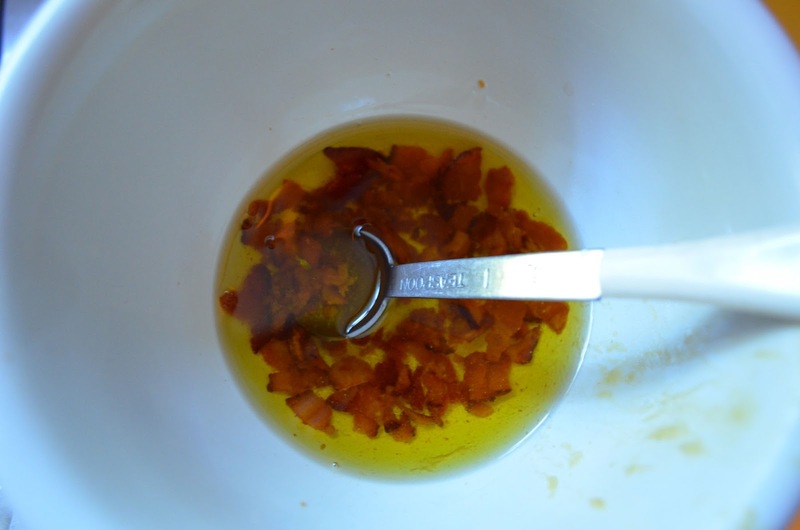 Once cool, pour bacon and drippings into a small bowl along with the olive oil. In a large bowl whisk mustard and vinegar. Slowly drizzle in the bacon-olive oil mixture, whisking to emulsify. Add the scallions, parsley, and salt and pepper to taste and whisk to blend. Using tongs, place the potato pieces on the hot grill and cook on all sides long enough to cook through and make grill marks, 1-2 min per side. Handle potatoes gently so they don't fall apart. 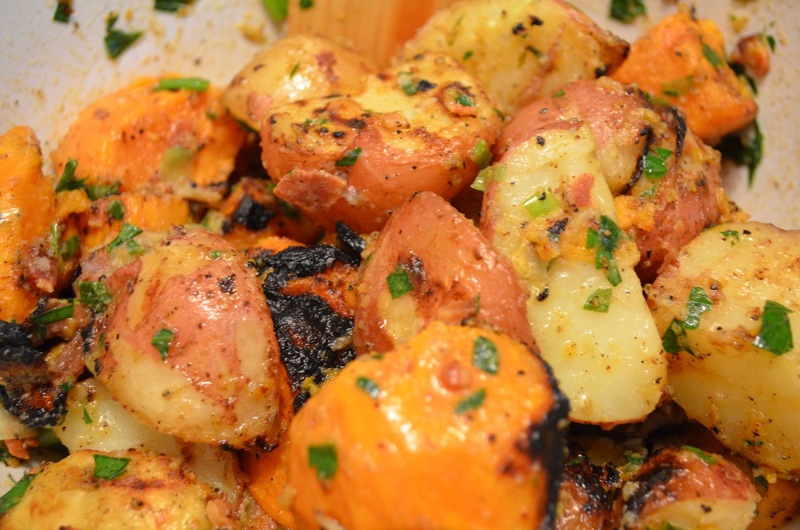 Remove the potatoes from the grill and place in the bowl with the vinaigrette. Gently toss to coat completely and serve warm or cold. Yum. That's all I've got to say about that. Off of the Couch and into the Mud!